AKI-PEKKA SINIKOSKI: LAST MACHOS ”If I am being totally honest, this party is slowly drawing to a close for me. I am making my way towards that endless summer. One day at a time.” I am Aki-Pekka Sinikoski and Last Machos is my photography project presenting the Finnish post-war generation. The men of that generation who climb, as if honoring the memory of their fathers, to the burning hot tin roofs of their houses to fix fire escapes, their newly installed hip prostheses creaking. The series of photographs paints a picture of the dearly beloved tough guys who can be found in almost everyone’s circle of acquaintances and whose everyday feats of valor spouses and children observe sometimes with great amusement and at other times with ultimate terror. Last Machos tells about identity, change, loneliness and in a broader sense about manliness and the essence of being a Finn. This series is a continuation of the photography series entitled Finnish Teens that I photographed in 2009–2011. Finnish Teens looked at Finnish teenagers by documenting the time racing by between childhood and adulthood and the sprouting identities that can be observed in teenagers exploring who they truly are as individuals. They are pictures of eager anticipation mixed with fear; the hope that one’s wings would become strong enough and one would rediscover oneself and one’s place in the world. The world is changing at an accelerating speed and just like a teenager looking at oneself in the mirror, an old man may have difficulties in recognizing the face in the mirror as one’s own. Furthermore, just like the teenager, the old man hopes that his wings will support him and make him soar: for as long as possible. 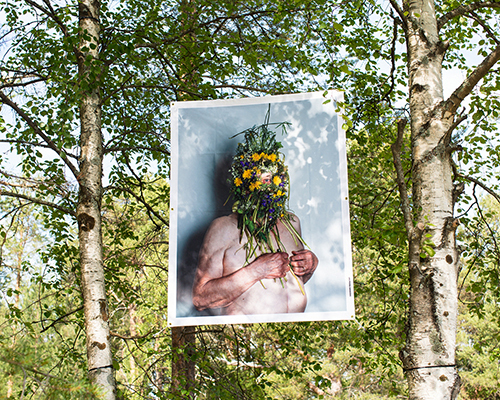 The photographies exhibited at Gallery Vanha Kappalaisentalo are colorful, tenderly humourous, but touching. They show us different worlds that over-lapp and complete each others like the novellas in a collection of short stories. The short stories describes the beauty and fragility of life and the fight against gravity. It is a question of time and waiting: of finding one self and one’s part in this world. At the same time the series documents a nation on the verge of a big change, people and stories from our era. I hope they will speak to both art lovers and those, who usually do not see art as their primary area of interest.